Getting divorced can be expensive. Going from paying for one shared residence to paying for two shared residences costs a lot of money up front, and those costs can be exacerbated if the divorce proceedings or the housing market prevent you from selling your house, or if you are locked into an expensive lease at the original shared residence. Legal fees, including attorneys, add to the expenses. In many cases, financial problems that already existed might have been a contributing factor leading to divorce, which means these additional expenses are only making things worse. It's not uncommon for people to come out of a divorce with a lot of debt and damaged credit. Repairing that credit won’t happen overnight, but every good financial decision will put you one step closer. Building and rebuilding credit is mostly about paying your bills on time and reducing your debt. To do that, you need to determine if you are bringing in enough money now that you no longer are sharing expenses with a spouse. If your current income and any alimony and child support you are receiving—if applicable—are not enough, you might need to look into increasing your hours, finding additional part-time work, or looking for another job altogether. No matter the source of your income, manage it well. A budget can help you make the best of your income. 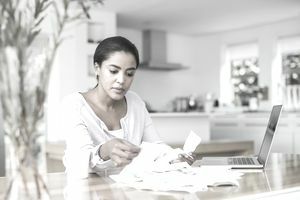 If you’re not used to managing money because your ex-spouse always took care of the bills, it can take some time to get used to paying bills and staying within your income. If necessary seek help from a trusted family member or friend to help you get a realistic budget on track. You can find out how to improve your credit by learning what’s affecting your credit. Pull a recent copy of your credit reports from all three credit bureaus for free through AnnualCreditReport.com. If you’ve already ordered your free reports for the year, you also can purchase single or three-in-one credit reports through any of the bureaus. Your credit score will give you some perspective on whether your credit history is good or bad. Purchase your credit score through FICO.com or any of the three bureaus. Or, get a free version of your score through CreditKarma.com, CreditSesame.com, or Quizzle.com. Many banks and credit unions also offer free scores as a feature of their checking accounts. You’ll never have complete control of your credit history if you still have open accounts with your ex-spouse. Your ex's actions—or nonactions—will continue affecting your credit score even after divorce, so it's a good idea to make sure the divorce settlement outlines steps for separating this debt. Ideally, the debts you’re responsible for are in your name only and those your spouse is responsible for are in his or her name only. A refinance, balance transfer, and consolidation are options for the two of you to restructure your debts so they’re in the responsible person's name. It’s common for ex-spouses to struggle financially in the months and sometimes years following the divorce. Seek help through consumer credit counseling if you’re having trouble paying all your bills. The counselor can help you assess your financial situation and help you decide the best way to deal with your bills. Depending on the severity of your situation, the credit counseling agency may suggest that you file for bankruptcy. If you’re going to legally change your name to your maiden name, do so before you start applying for new credit. That way, your new accounts will be issued in the legal name you’ll use going forward. Also, contact your existing creditors to have them change the name on your accounts. A name change won’t affect your credit since accounts are linked based on your social security number. All variations of your name will be listed on your credit report. Get a secured credit card if necessary. The key to building a good credit score is to show that you can handle credit responsibly. That includes borrowing only what you need and making payments on time every month. If you already have accounts in your name alone, you’re on the right track. Pay these on time every month and keep your credit card balances below 30 percent of the credit limit. If you were an authorized user or joint account holder on your ex-spouse’s credit cards, you may already have a credit history. In that case, it may not be difficult to open new accounts in your own name. The best way to tell is to put in an application. Use your recently pulled credit report and credit score to get an idea of the types of credit cards you should apply for. For example, if you have a bad credit history, look for credit cards for people with bad credit.